depend on hatchery stockings to maintain successful recreational fisheries. The 2013 work was conducted as recommended in each species’ statewide management plan and included a trap net survey for both species and a nighttime boat electrofishing survey for walleye. Fisheries biologists from the PFBC’s southeastern fisheries management office conducted a trap net survey at Nockamixon Lake between April 8 and 19, 2013. The objectives of the survey were to: 1) evaluate the abundance and size structure of the Tiger Muskellunge population, which was a continuation of a multi-year study that began in 2012; and 2) evaluate the abundance and size structure of the walleye population in conjunction with electrofishing data collected on April 3, 2013. A total of 20 Pennsylvania style trap nets were set and enumerated between April 8 and 19. Four to five trap nets were set daily in water depths ranging from 5 to 11 feet and allowed to fish overnight (approximately 22 hours each). The following day each net was tended, fish were processed and released, and each net was then re-located to ensure that a random sample of suitable habitats were evaluated, including areas in the main lake, Threemile Run Cove, Tohickon Creek Cove, and Haycock Creek Cove. Captured Tiger Muskellunge were measured for total length and weighed. A fin clip and Passive Integrated Transponder (PIT) were applied for future identification. PIT tags are microchips that provide each fish with a unique numerical code. Scales were also collected and will be used in combination with sectioned fin rays for age and growth analysis. Other fish species captured, such as Walleye and Channel Catfish, were counted, measured for total length, and released. A total of 26 Tiger Muskellunge were captured during the trap net survey. The fish ranged from 19 to 39 inches long and 2 to 15 lbs, but the majority of fish were between 33 and 39 inches long (see Figure 1). The Tiger Muskellunge catch rate was 0.06 fish/hr or 5.2 fish for every four trap nets set. This catch rate (0.06 fish/hr) exceeded the 2012 catch rate of 0.03 fish/hr and statewide minimum catch rate objective established for Pennsylvania’s reservoirs of 0.01 fish/hr, indicating that the abundance of Tiger Muskellunge in Nockamixon Lake was very good. No legal size fish were captured, which was also the case in our trap net survey in 2012. Tiger Muskellunge fishing in Nockamixon Lake should be good in 2013, and continue to be good in the future. In the first half of 2013, angler catches of Tiger Muskellunge were reported to be good with some anglers describing catches of multiple fish in one trip. Most of the Tiger Muskellunge caught by anglers were between 24 and 38 inches long; however, fish up to 45 inches long were reported. In addition to tiger muskellunge, a few pure Muskellunge, were caught by anglers in 2013 and observed by PFBC’s fisheries biologists while electrofishing on April 3, 2013. This indicated that there had been at least some survival of the 1,200 fish that had been purchased and float stocked by members of Muskies Inc., Chapter 50 in November, 2012. The pure muskellunge were distinctly marked (spotted) and approximately 14 to 15 inches long when captured by the PFBC’s sampling crew and appeared to be in good condition. Survival is expected to be high given the advanced sizes of the pure Muskellunge that were stocked. established for Pennsylvania’s large reservoirs. The lake barely met the 0.075 legal fish/hr minimum acceptance level for continuing fingerling Walleye stockings. In addition to Tiger Muskellunge and Walleye, a total of 20 other fish species were captured during the trap net survey (see Table 1). Although Tiger Muskellunge was the primary species of concern during the survey and the timing of the survey and/or gear type were not appropriate for the evaluation of some species, such as Yellow Perch, Smallmouth Bass, Largemouth Bass, and Striped Bass (and hybrids), several observations were made with respect to other species. The total catch rate of Channel Catfish was below average for southeastern Pennsylvania, but the catch rate of fish over 20 inches long, which comprised 64% of the catch, was very good. The largest Channel catfish captured was 30 inches long. White Catfish were also caught in good numbers with fish up to 21 inches long captured. Bluegill were numerous, but few fish were over six inches long. The total catch rate of crappie and catch rate of crappie over nine inches long were below average for southeastern Pennsylvania. The largest crappie captured was 16 inches long. White perch up to 14 inches long were also captured. Few Smallmouth and Largemouth Bass were captured, which was expected since it is well established that trap nets are not an effective gear type for capturing bass, especially Largemouth Bass. Table 1. Summary of fish species captured in Nockamixon Lake between April 8 and 19, 2013. Notes: Trap nets are not an effective gear type for capturing bass. Fisheries biologists from the PFBC’s southeastern fisheries management office conducted a nighttime boat electrofishing survey on Nockamixon Lake on April 3, 2013. The objective of the survey was to evaluate the abundance and size structure of the Walleye population during the spring spawning period in addition to evaluating the post- spawning population during the Tiger Muskellunge and Walleye trap netting between April 8 and 19, 2013. Nighttime boat electrofishing was conducted along shoreline areas in Tohickon Creek Cove, the southern shore of the main lake, and dam breast. Captured Walleye weremeasured for total length and sexed. Scale samples were also taken for age and growth analysis prior to release. A total of 17 Walleye, ranging from 22 to 30 inches long, were captured during the electrofishing survey, including 10 males and 7 females. The Walleye catch rate of 8.8 legal fish/hr was below the statewide minimum catch rate objective of 18.0 legal fish/hr established for early spring night electrofishing in Pennsylvania’s large reservoirs. It was also well below the southeastern Pennsylvania regional average (27.2/hr) for lakes of mixed sizes, but was generally consistent with the 1997 walleye catch rate of 10.8 fish/hr for Nockamixon Lake, the date of the most recent comparable survey. Although the electrofishing catch rate was below the statewide objective, the 2013 trap net survey data discussed earlier indicated that Nockamixon Lake supports a minimally acceptable Walleye population and, therefore, based on fingerling Walleye availability, will continue to be stocked annually, at least in the near future. Given the cost of stocking an average of 31,900 Walleye fingerlings in the lake per year over the past decade and the small difference between the statewide minimally acceptable walleye trap net catch rate and the 2013 trap net catch rate for Nockamixon Lake, the lake’s walleye population will continue to be monitored in concert with the muskellunge population. Surveys monitoring catch rates will occur at least three more times within the next eight years to determine whether continuing the Walleye stocking program in the lake is prudent. That determination will most likely occur over a shorter time period, however. Although Walleye were the primary species of concern during the electrofishing survey and the timing of the survey and/or gear type were not appropriate for the evaluation of some species, several observations were made with respect to other species. Good numbers of Largemouth Bass over 15 inches long were observed. 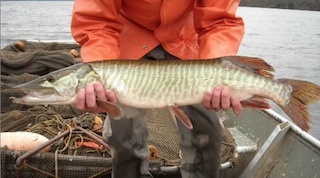 Several of the pure Muskellunge that were stocked by Muskies Inc., Chapter 50 in November, 2012 were also observed and averaged approximately 14 inches in length. Other fish speciesobserved while electrofishing included White and Black Crappie, Bluegill, Redbreast Sunfish, Common Carp, American Eel, Gizzard Shad, and Alewife. If you plan on fishing Nockamixon Lake, please be advised that the lake has a 20 horsepower outboard motor restriction and is managed under the Big Bass Program Special Regulations. Nockamixon Lake has four boat launch areas and a public fishing pier. Please see the Pennsylvania Department of Conservation and Natural Resource’s website for additional information on Nockamixon State Park. 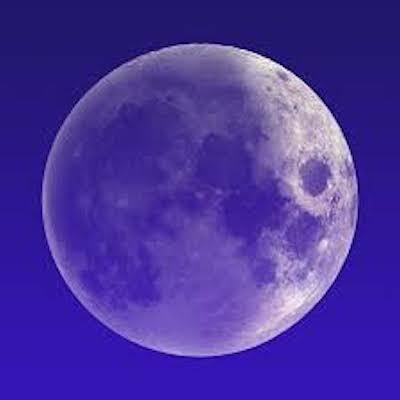 Calendar Moon ends. This calendar shows 106 weeks into the future. If your calendar is not updated, please set your calendar software to update automatically or re-subscribe the calendar from www.webcal.fi. Join us upstairs for our monthly meetings. Fun – Food – Drinks – Raffles!